Cowley College administrators and members of the Wichita community took part in a ribbon cutting ceremony for Cowley’s new Wichita Downtown Center Thursday at the facility located at 532 South Market. The Wichita Downtown Center also offers hybrid classroom space for Cowley College academic programs and business and industry training opportunities. “These classes accommodate the adult with a complicated life schedule,” Cowley College president Dr. Dennis Rittle said. Kresta Dundas, manager for membership development, represented the Wichita Metro Chamber of Commerce at the ceremony and thanked the college for allowing the Chamber be a part of the event. “Thank you for supporting the Chamber and being such a great community member,” Dundas said. Along with the Wichita Metro Chamber of Commerce, the Postsecondary Technical Education Authority, and many local business leaders had a supportive presence. 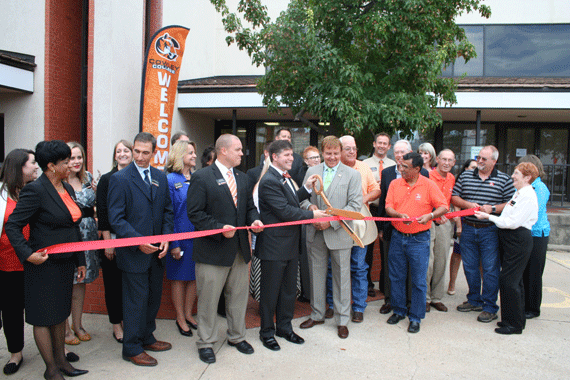 The ribbon cutting ceremony was hosted by the Cowley College Foundation. Cowley graduate K.C. Udarbe provided music throughout the event which featured tours of the facility and a special presentation. Dr. Rittle praised the work done by vice president for institutional advancement Ben Schears and director of marketing Sarah Bryant leading up to the event and also thanked members of the Board of Trustees in attendance. Schears also had an opportunity to speak at the event on behalf of the Cowley College Foundation. “We are excited to be a part of the Wichita community and look forward to building relationships,” Schears said.